Super Mario World 2: Yoshi's Island is a platform game that uses the Super FX GSU-2 chip. As Yoshi (with Baby Mario onboard), your mission is to rescue Baby Luigi from the evil Kamek. 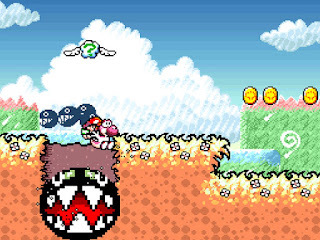 Enemies can be stomped, but Yoshi's main attack is grabbing enemies with his tongue, swallowing them to create an egg and then using them as projectiles. Eating a watermelon allows you to spit seeds, fire or ice, and you can also transform into numerous vehicles such as a helicopter and train. Each level is scored and gaining top marks involves locating 20 Red Coins, 5 Flowers and 30 Stars; these Stars are important as each time you take damage Baby Mario floats away and if you don't save him by the time your Star total depletes you lose a life. The level design is wildly varied (even within the same world) and the game never rests on its laurels and instead chooses to constantly surprise. It's almost as if Nintendo threw in the kitchen sink, yet it's cleverly done in a thoughtful, player-centric manner rather than feeling chaotic or disjointed. Everything is playful and encourages interaction (such as being chased by a giant Chain Chomp, or having to push a boulder through an entire level to mow down enemies! ), and there's tons of secrets to find. The ability to max out stars, coins and flowers in each level goads you to explore every nook and cranny, and it also creates a completionist mentality that rewards you with hidden levels; this gives the game a huge amount of replayability. The bosses are imaginative too and show off the power of the Super FX GSU-2 chip in terms of sprite scaling. Rounding out the package is the beautiful art style, luscious music, and handy auto-save feature with three slots. Super Mario World 2: Yoshi's Island is one of the greatest and most unique platformers of all-time and there aren't enough superlatives to describe how good the adventure is. It's a timeless classic that manages to impress at every turn thanks to its expertly crafted levels that are an absolute blast to play. Random trivia: There are several unused transformation sprites in the ROM, such as a plane, mushroom and tree.